At the top of my WIP list are a couple of stockings that were ordered from my Etsy shop, unfortunately I had to order fabric for them so I haven't even started yet. Right behind those is my Marcelle Medallion! I LOOOOVEE this thing and I am so glad that I am claiming it as all mine when it is finished. Getting those geese right was the hardest part, but now that I've got those suckers on there I am ready to tackle the other borders. I still have this thing to quilt. I cut the batting for it the other day, now I just need to get the backing put together so I can finish this up before my sister kills me for taking so long. This was her birthday gift.... her birthday was in August. I finished my quilt top for the Shining Stars BOM, now I just need to order some Color Me Retro fabric for the backing and binding and this baby can be put in the done pile. Well I need to quilt it too. I think that is it for my list, I really need to tame my crafty ADHD because I'm a tad overwhelmed with all the projects I have going on right now. At this point in time, I am trying to take one day at a time and not let myself get stressed out that much. I love seeing the medallion quilt in all one colour - very striking. 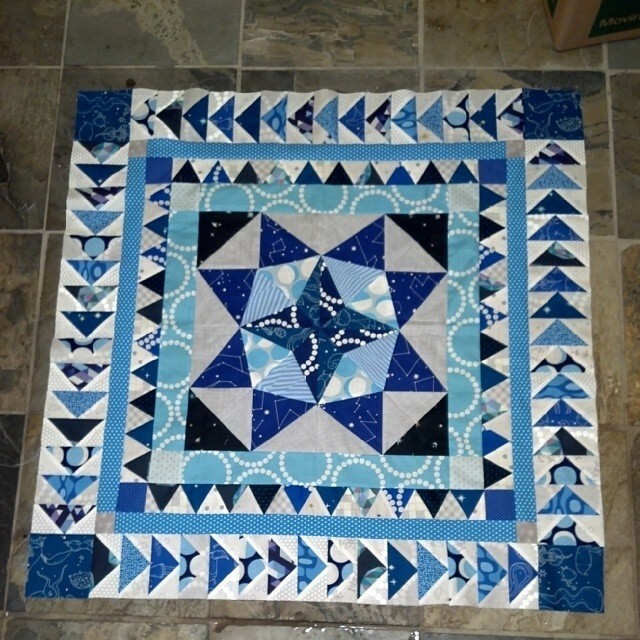 What a lovely medallion quilt ! You have quite a list there, but I definitely think that we all can relate! I love the purple and green quilt in the middle. Is that from a pattern? If so, what is it? I love it! Your quilt tops are sew pretty and love the hint of boys toys on the floor! I love the medallion. It's fantastic, and I also love the feeling of getting to keep it when it's done. The stars came out very nice. All your WIP's are gorgeous!! You're a busy girl! What colors did you use for the backgrounds on your Shining Stars and your sisters quilt? I love all the blues in your medallion. Can't wait to see the finished quilt! Love your medallion so much, one of my faves!! Can't wait to see more!